SuperPhillip Central has a special review for this Friday of a game that recently released. Until then, though, let's keep our minds focused on the present (no matter how much Back to the Future Day would tell you differently) with a review of Momonga Pinball Adventures, a spirited take on the pinball game. Pinball has always been a bane to my existence. I was never good at keeping that marble ball from falling through those two flippers. While others were pinball wizards, I was more like a pinball novice in training. That said, there have been some video game versions of pinball that have kept my attention and have allowed me to enjoy them, such as Kirby's Pinball Land, Pokemon Pinball, and Zen Pinball, to name a few. 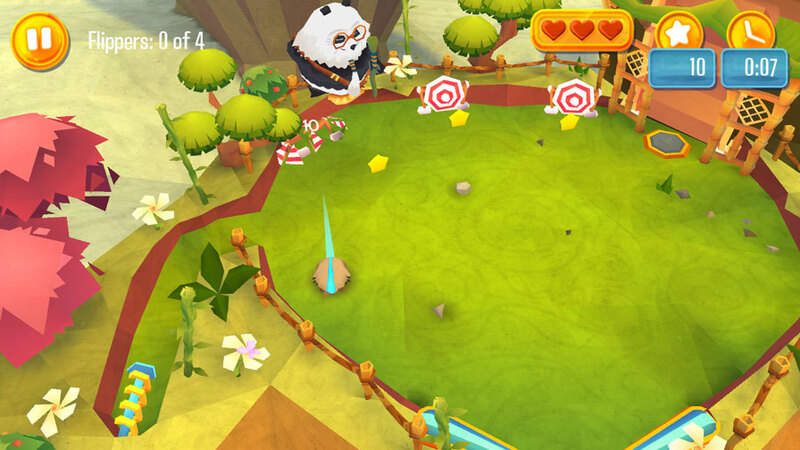 Momonga Pinball Adventures from Paladin Studios is now a new title to add to that impressive list of games, although it's an experience that is marred by some sizable issues. You play the role of Momo, a flying squirrel known as a momonga, whose village has been assaulted by a rampaging pack of sinister owls. All of his friends and family members were taken from the village, but luckily, Momo encountered a panda who rescued him from the owl onslaught. The panda soon prepares Momo for the journey ahead with a lesson in pinball. Momonga Pinball Adventures features the prospect of enjoying a journey filled with pinball levels. However, you quickly realize the journey will be short-lived, as there are but twelve stages within the game, and a fourth of those are little mini-game levels. Thus, Momonga Pinball Adventures can be beaten within an hour's time. That said, what levels there are are generally well designed and feature plenty of interactive areas both obvious and hidden. allowing Momo access to the next portion of this level. To combat a short-lived experience, the developers at Paladin Studios have added challenges to each level of the game. 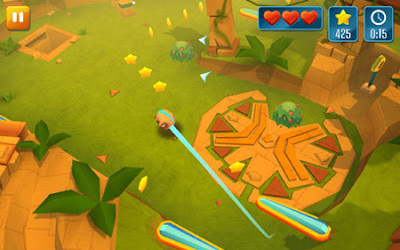 There are five in each level, and these range from simple tasks like just clearing the level to more complicated tasks like clearing a level in a set amount of time, collecting all of the stars in a level, breaking a specific number of obstacles, and clearing a stage with a limited number of hits. These challenges are enjoyable, but you can't clear them except in a linear order. 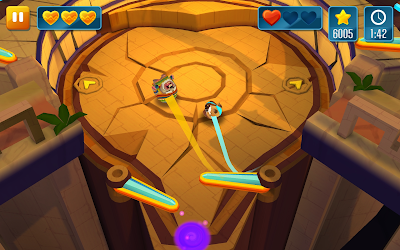 Plus, there is the fact that you must play the same level at least five times to clear all five objectives, as you can't complete more than one in the same run. all three targets with only four shots of the flippers. 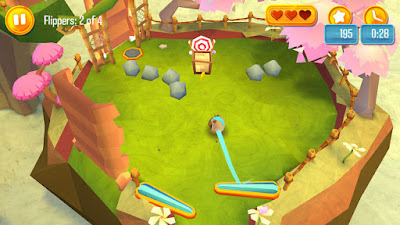 Therefore, you have an issue here where players who just want to beat the game will not get their money's worth through the one hour of play time required, and players who want to complete all of the challenges might become too bored by the repetition required through playing the same stages over and over again. For me, I found that the levels were short enough that playing them multiple times was entertaining enough, and it made me slowly get better with practice. This required practice from replaying levels makes it so you can tackle the harder challenges within Momonga Pinball Adventures. for the adventuring type in all of us. The first goal of each level is to simply reach the end, and this is through hitting Momo with various pinball flippers to the top of each room. Many levels feature enemies and obstacles that wish nothing more than to stand in Momo's way and cause him trouble. Momo has three hearts to work with, and falling through the hole between the flippers crosses off one from his count. Lose them all, and you have to restart the level from the very beginning. The pinball physics are immensely precise and feel great. One of the little messages that plays during the loading screens says that one level in Momonga Pinball Adventures generally took the developers one month to make. You can tell, as the physics are practically perfect. You will always lose because you failed-- not the game's physics. Sometimes your hands will be full with two characters to worry about. Speaking of failures, though, Momonga Pinball Adventures does suffer from some technical issues. I've encountered three occasions in my two hour playtime where my Wii U locked up, requiring me to unplug my system. Also, there are some audio glitches as well to consider that rarely but do pop up occasionally. That said, it says something about this game that despite these issues, I couldn't wait to return to playing the game, even when it froze in the middle of one of my better runs. 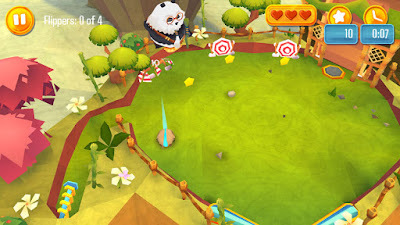 Momonga Pinball Adventures is truly a fun game, but it depends upon if you can handle the repetition from replaying levels to complete the different objectives each level has. The online leaderboards and the game's achievements to complete also add to the longevity of this otherwise very brief game. If you're looking for an atypical pinball game with adventure elements to its credit, Momonga Pinball Adventures should be on your must-watch and maybe your must-play list, too. Review copy provided by Paladin Studios.